through an easy-to-use and intuitive solution. in the event of theft or compromised device. and by restricting their access to inappropriate apps or websites. TinyMDM made Android Mobile Device Management easy to use. Silent app installation/removal, business dedicated app catalog, private app deployment, web app… Decide in a few clicks which apps are essential and authorised on your company owned devices. 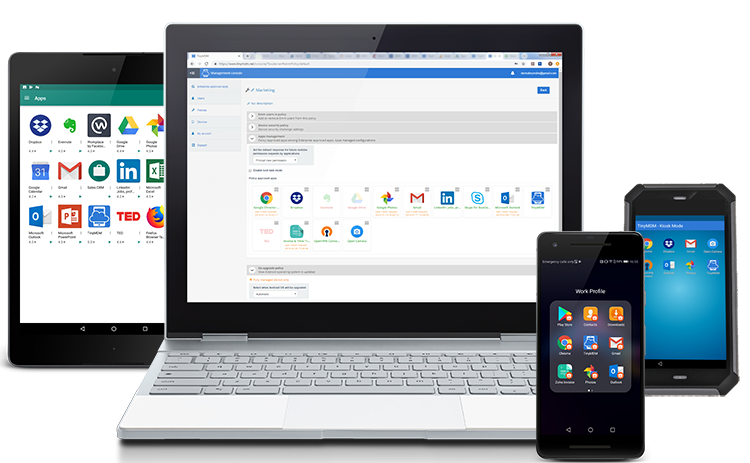 Single and multi apps lockdown, app auto launch, homescreen and task bar restriction… Turning your device into a Kiosk mode is the perfect solution for devices supposed to perform a single task. Instantly lock/unlock device, remotely wipe out all data from corporate device or business data from personal device… Keep control of sensitive data in the event of theft. Filter out inappropriate content on every browser, setup a whitelist/blacklist of websites… Simply choose between four levels of restriction and control browsing on enrolled devices. The location tracking feature helps you determine and track the location of corporate devices in real-time, on an interactive map. Enforce safe passwords and work profiles, monitor enrolled devices for compliance… Gain total control of policies and take security measures if needed. Mobile Device Management is such an important element in educational institutions and classrooms. Public and private schools are using digital equipment as a tool for delivering custom knowledge to students, boosting their engagement. With TinyMDM, mobile devices can be configured to deliver a specific curriculum (educational apps, collaborative work profile…) and protect students from unwanted content (web filtering, app blacklisting…). Some industries must deliver a high degree of performance when working on rugged devices, especially in harsh work environment like warehouse, manufacturing, transport, hospital, etc. This type of devices is no longer built with outdated technology and limited capabilities: sunlight readable display, shatterproof, shock resistant, most of them now run on Android OS and need to be securely and completely managed to meet new enterprise challenges. Regardless the type industry, small and midsized businesses may not have a dedicated IT department or enough time to elaborate a complex MDM strategy. TinyMDM is here to provide them with a highly scalable, easy-to-use and affordable MDM solution. "Not being computer experts, we chose tinyMDM for its simplicity of implementation and its efficiency"
"TinyMDM made it easy for us to use our business applications for measurements and readings. The productivity of our teams has increased significantly"